Not too many straight horror stories for children are made these days, but it’s one of the most important genres for kids to experience, serving as a gateway to understanding the dangers and problems they will inevitably encounter. Experiencing and processing darkness in pop culture is a formative experience—just ask anyone who witnessed Mufasa’s death at a young age (though The Lion King, like Bambi, is more traumatic than scary). Determining criteria for good children’s horror is difficult, depending on countless specifics and variables, but here’s one metric that should be evaluated: the degree to which the art pulls punches. Kids have an uncanny ability (a sixth sense, if you will) to know when they’re being lied to, and horror that doesn’t brush off the danger at its core seems particularly appreciated by little ones. The Scary Stories To Tell In The Dark series—infamous for its ghastly drawings—is revered in elementary school libraries, pored over because the stories are so nasty they have to be “true.” (There was an outcry when the illustrations were “updated” and tamed.) For all the fun of R.L. Stine’s Goosebumps, he never seemed too intent on actually spooking the reader, so interest in them was more ephemeral. Possibly no writer knew how to navigate this genre better than Roald Dahl, who had a singular ability to speak to kids without condescending, and who knew how to be scary without being too scary. Miss Trunchbull, the devilish headmaster of Matilda, was truly threatening, abusive to kids and a murderer. She wasn’t exactly Blood Meridian’s Judge, but within the context of the book, Dahl held nothing back, which is why she’s lasted in the popular consciousness where any number of lightweight bullies or villains with comic streaks have faded. Most directors adapting Dahl’s work have tampered it down some. Danny DeVito’s Matilda made Trunchbull more cartoonish than threatening, and heightened the comic absurdity of the title character’s unloving household. Tim Burton’s Charlie And The Chocolate Factory upped the weirdness quotient into playful territory and turned Willy Wonka into another of the director’s misunderstood loners. Even Steven Spielberg, whose E.T. was a family film that stared directly into bleakness, lightened up his version of The BFG, luxuriating in the story’s visual potential rather than its darkness. Both versions of The Witches start with the unhappy news that witches are real and live among us, and though they can be spotted—they are bald, clawed, toeless, and with peculiar eyes—they pass themselves as ordinary women. (“I do not wish to speak badly about women,” Dahl’s narrator admits. “Most women are lovely. But the fact remains that all witches are women.”) So convincing are they that even our hero—unnamed in the book but Luke in the film, where he’s played by Jasen Fisher—barely evades capture when one attempts to lure him out of a tree by offering him a snake to play with. Luke is prepared for such a threat, having been briefed on them by his grandmother, a former witch-hunter (an unexplored past, sadly). After the incident in the tree, “Grandmamma” (Mai Zetterling) is somewhat stoic about the threat Luke escaped, which is almost more unnerving than her literary counterpart’s white-faced fear; as she says later in the film, victories by witches are so common that one becomes used to them. Roeg drops the deadly and playful extremes, perhaps understandably. Showing dead bodies or devastated parents would be too much, while the porpoise runs the risk of adorability. Instead, he focuses on another story from the book, of a child who is banished into the world of an oil painting, where her likeness ages with the years and eventually disappears. In both versions this is a terrific mini ghost story, spooky and atmospheric in the right amount. The main thrust of the story kicks in when Luke suffers a pair of tragedies. First, his parents are killed in a car crash, then Grandmamma falls deathly ill. The latter is more of a test for kids. The crash occurs off screen, the parents weren’t developed characters, and orphans are ubiquitous in such stories anyway. The illness, on the other hand, feels very real; in the book, Luke writes of the “oxygen cylinders and all sorts of other frightening things” that begin to fill their house, the kind of detail that would stick out to and trouble a child. When her condition improves, Grandmamma and Luke visit a seaside resort to recuperate. What they soon learn, however, is that the resort is also hosting the annual meeting of all the country’s witches, a meeting where the Grand High Witch will unveil a potion that will turn children into mice. As luck would have it, Luke is hiding in the ballroom when the meeting occurs. This meeting is the centerpiece of both the book and the film, and it is remarkable how neither Dahl nor Roeg hold back with it. Dahl raises his suspense slowly, with glancing mentions of such telltale signs as women wearing gloves scratching their hair (wigs), then he escalates it completely as the Grand High Witch just straight-up murders one of her underlings. The illustration in particular hits pretty hard, not holding back anything with the violence or the hideousness of the unmasked leader. Millions of young readers white-knuckled it through this section (this author has visceral memories of it himself), which is exhilaratingly intense, though manageable in how Luke’s safety isn’t in question until suddenly it is. In the film, the impact of this scene comes in a few different forms. 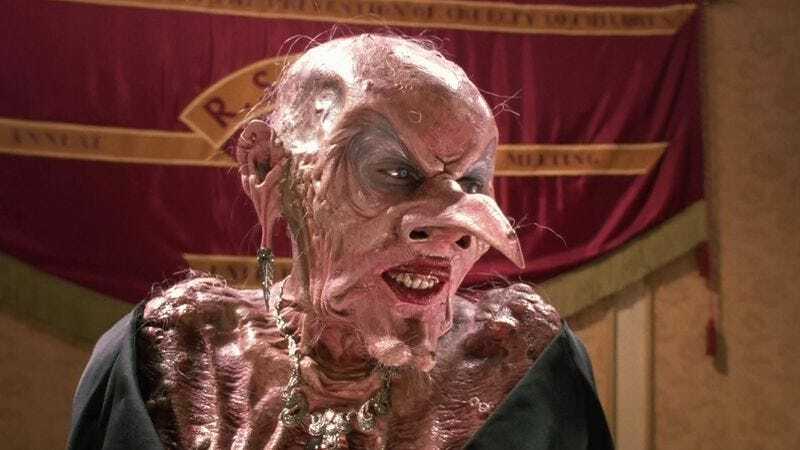 Most obviously, Roeg goes pretty extreme with the depiction of the Grand High Witch, whose real face is a masterpiece of horror makeup (done by Jim Henson, who was just as effective as Rick Baker despite his work being geared toward children). Were The Witches remade today, it’s hard to imagine a director going this full-out ugly, or including the shot of the mask being peeled off. The Grand High Witch (Anjelica Huston) removes her mask. In the book, the Grand High Witch is more memorable as a threat than a personality. She’s a terror when unmasked but unremarkable otherwise; in human form she’s described as a pretty but quiet woman of about 25. The fleshing out of the character marks one of the big advantages of the film, with Anjelica Huston clearly relishing the opportunity to vamp about. She makes bold flourishes in voice and gesture, adding to the creepiness even when she’s not in makeup that makes her look like a vulture turned inside-out. Look at the way her body writhes in anticipation when she prepares to test her potion on an unlucky boy named Bruno (Charlie Potter)—it’s clearly orgasmic. Kids wouldn’t pick up on that, but they would get how her evil is much closer to the surface than it is in the book. In a scene invented for the film, she pushes a baby carriage down a hill, sending it careening toward a cliff. Luke stops the carriage at the last minute, owing to a notable change from the book. In Dahl’s version, Luke is captured in the ballroom and force-fed the potion, turning into a mouse immediately and escaping. In Roeg’s, he is discovered but escapes, and is only turned when the witches break into his hotel room. This version is more unsettling; it is a far bigger violation to be sought out and attacked rather than being “punished” after being caught for something. The climax of the story involves mouse-Luke stealing the potion and sneaking it into food meant for the witches, basically wiping out the lot of them. This sequence is fairly similar across the versions, though the film is far more explicit about showing the hotel staff slaughtering the mice—and the goo that bursts forth when Huston is cleaved in two. Bigger changes come in the coda, after Luke and Grandmamma return home. Dahl characteristically writes a hilariously bleak conclusion, which includes the offhand exchange that Bruno’s mouse-hating parents likely drowned him rather than get rid of their beloved cat. To the extent that the book’s ending is happy, it’s because of how doubly unhappy it is: As a mouse, Luke is doomed to a short lifespan, but at least Grandmamma is old herself, meaning she’ll likely die soon, too. And in the meantime, they can spend the rest of their few days traipsing around the world, turning every country’s witches into cat food. Changing this ending proves to be the film’s biggest flaw. Roeg (with screenwriter Allan Scott, also of Don’t Look Now) invents a witch who survived the carnage and tracks the two down. But rather than being a final threat to overcome, she cheerfully changes Luke back into a boy before going on her merry way to do the same to Bruno. The idea of a witch being conflicted about killing children is an interesting one, but as the character isn’t developed, it comes off as a pretty transparent attempt to end the story on a happier note. Not only does this demolish the integrity of Dahl’s ending, but it scarcely seems necessary—Luke is content in his new form, and the mouse-friendly setups Grandmamma engineers are pretty dope. Dahl reportedly hated the ending, which is easy to understand. The whole point of the book seems geared to his conclusion, teaching the tough-but-necessary lesson that some things cannot be undone, and that people should fight on regardless of what hardships they are beset with. Roeg’s version suggests that no matter what, things will turn out all right. It’s a nice idea, but not an honest message, and pulling his punch at the last moment renders the film oddly spineless.